Watercolour by an anonymous artist of a painted choultry at Thanjavur in Tamil Nadu, dated c. 1784. 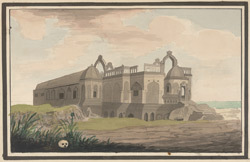 The image is inscribed on the front in ink: 'Painted Choultry at Tanjour.' A choultry is a Hindu caravanserai, a resting place for merchants and travellers undertaking long journeys between large towns and cities.